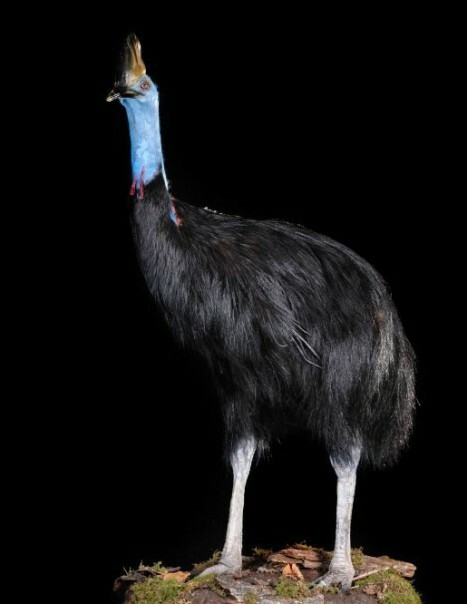 The Southern cassowary is part of the Casuariidae family. 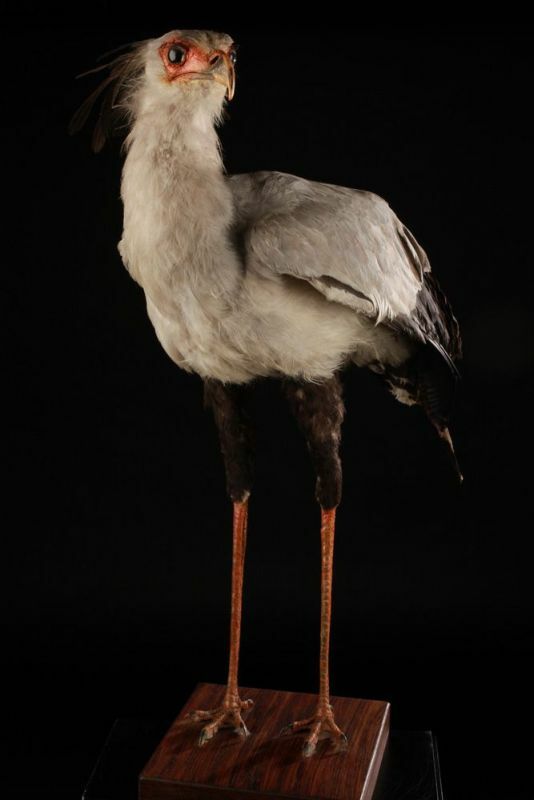 This is the largest bird after the ostrich. This species differs from the others because the criteria relating female. 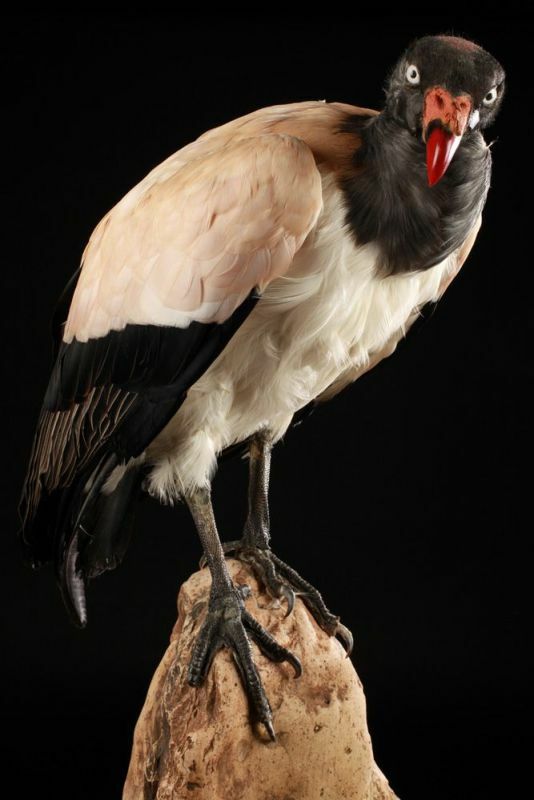 It rather presents the characteristics of most males, as brighter plumage color, size, it does not share the nesting duties, it abandons the nest and eggs to mate with other males. The adult male has glossy black plumage. This plumage is very hard and coarse, allowing it to live in inhospitable habitats. The tail has no feathers, and wings are small, these wings are just plain tubes, rounding off around the edges, probably as protection of the body against the thorny and dense vegetation. On the head, bare skin is light blue on top and darker and bright on the cheeks and sides of the head. The nape and the neck are covered with red bare skin. Two red wattles hanging from the chin. At the top of the head, we can see a horn-colored helmet. Higher in the female. The powerful beak is short and curved downward. The eyes are brown surrounded by a light blue eye ring, its strong and not feathered legs are very powerful. And it has only three fingers, with a strong brand. The internal finger wears a long dagger-like claws several cm long. Legs and feet are gray. It measures between 130 and 170 cm and a weight of 29 to 34 kg for males and 58 kg for females. In both sexes, wattles can change color depending on the mood, like the sounds it makes are varied depending on the time. This bird is silent outside the breeding season. Before mating, the male emits specific sounds. The Southern cassowary frequent rain forests, galleries or swamp forests, where it can live away from the disturbances and medium altitudes. It lives in the islands of Aru and Seram in Indonesia, New Guinea and northeastern Australia. It feeds on fruits fallen on the forest floor, low branches or bushes. This species needs a wide variety of fruit plants throughout the year. It takes about 75 differents plants fruits. 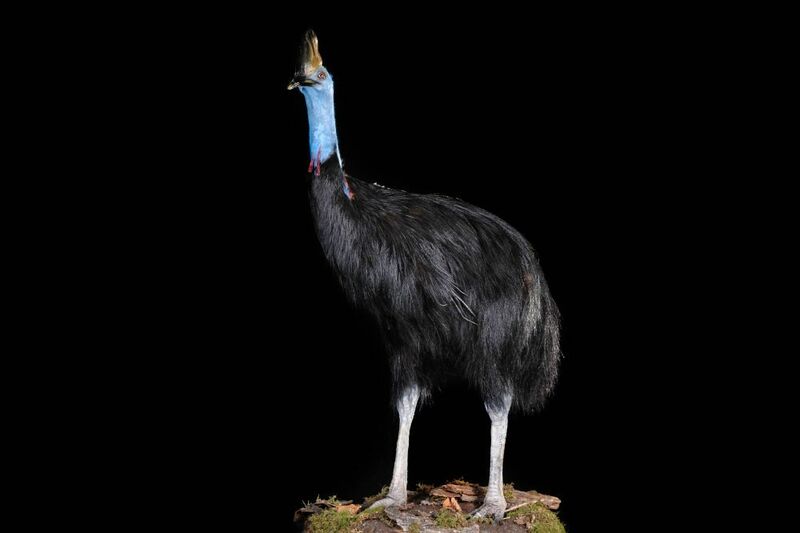 The Southern cassowary doesn’t fly. Its legs and strong fingers allow it to run at a speed up to 50 km/hour. It is able to jump up to 5 meters high. It can also swim and cross lakes and wide rivers without difficulty. It is very shy and difficult to observe. As it disappears into the thick of the forest whenever an intruder approaches, it is solitary outside the breeding season and defends its territory all year. It is sedentary but can make some erratic moves. It sits at mid-day and feeds the morning and late afternoon. During the breeding season, it becomes aggressive when the chicks are present. The female is dominant and the male escapes if the largest female performs a threatening parade. Reproduction starts at the end of the dry season in New Guinea and from June to October in Queensland, Australia. The female mates with several males and disappears after laying. The nest is dug in the ground and the interior is lined with leaves and grass. She lays 3 to 5 green eggs. Incubation lasts about 50 days and is provided solely by the male who feeds and raises the youngs for nine months.